As predicted on Monday, the Xbox One S All Digital console from Microsoft was launched yesterday evening. There are few, if any, surprises in the official announcements from Microsoft but it is nevertheless good to read the full details and see actual pictures of the upcoming device and packaging. 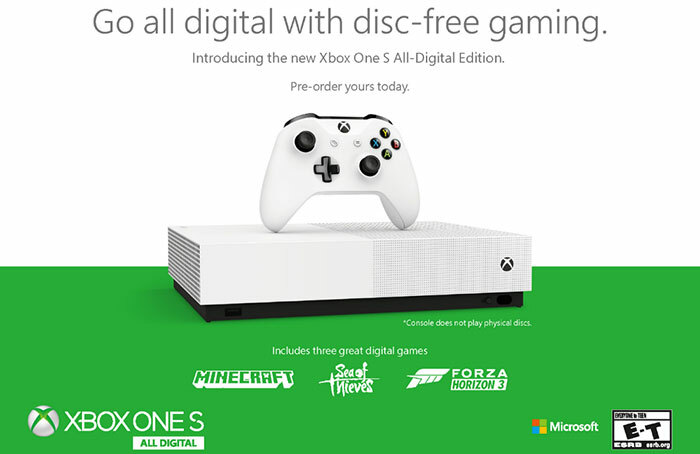 It is interesting to see Microsoft advertise "disc-free gaming" as some kind of selling point, as you can see in the promotional graphic above. Under the picture of the console you can see that the initial bundle will include three popular games; Minecraft, Sea of Thieves, and Forza Horizon 3. 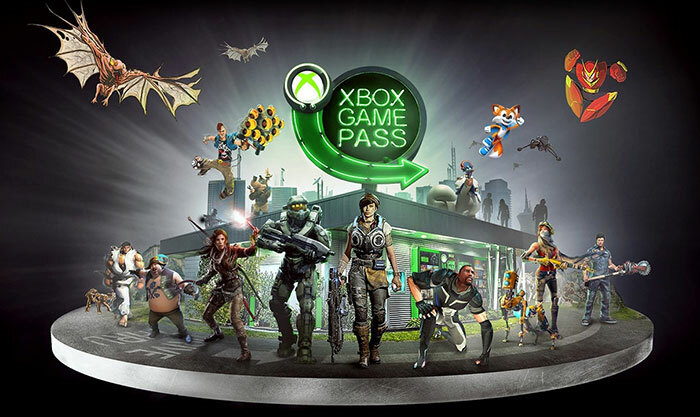 In the accompanying blurb, Microsoft notes that buyers will get "a special offer to get started with access to over 100 great games," via its Xbox Game Pass. The regular US price for this online library of games is $9.99 / £7.99 per month. I can't see any solid details of the special offer (perhaps 1 month free) but checking out the Xbox Games Pass page as a non-Xbox-owner I was offered; a free 14 day trial, or a first month or even first quarter subscription for just £1. For online multiplayer games you will also need to subscribe to Xbox Live Gold. Even though the optical drive has been removed in this Xbox edition, Microsoft reminds 'cord cutters' that they can easily enjoy 4K HDR entertainment with Netflix, Amazon and more - and there are thousands of games available on the Microsoft Store. Some might be disappointed by the pricing of the Xbox One S All Digital. In the US, the launch bundle, outlined above, including a single Xbox Wireless Controller is $249. Microsoft says the price represents a $50 discount compared to the current standard Xbox One S. In forthcoming packs and bundles Microsoft aims "to maintain at least that price difference between the two consoles". Here in the UK the initial Xbox One S All Digital bundle has a price of £199. Pre-orders are available now, and deliveries / availability will begin from 7th May 2019. As a reminder, Microsoft is expected to reveal next-gen Xboxes at its E3 2019 Briefing event on 9th June at 1pm PT. If you are already an Xbox One owner, there's some good news for you in the shape of the Xbox One April Update. Highlights include a new mini virtual keyboard option, uninstall suggestions to free up space, and faster access to your Game Pass quest progress. You can read more about this update on the Xbox Wire blog. Nope, too expense, a disk based One S can be had for £180-£230 (new!!!). Why would i buy a non disk version if they're the same price, absolutely stupid! 3 games you can't trade away either! Its about the difference in cost of the drive, why would it be cheaper? This is likely eventually just going end up replacing the disc version. And all available with game pass which is essential for this version… If it was a bit cheaper it would be a bargain as Game pass is pretty amazing if you take advantage of offers (9 months for £25 thanks Microsoft!). I can't help but feel this at £100~£120 would have flown off the shelves.